This Hotel is located in the beautiful town of Agii Apostoli within Chania Crete. Strategically situated between one of the most popular beaches in Europe, a short 80 meters walk from Agii Apostoli beach, as well as other entertainment facilities such as traditional tavernas and restaurants. 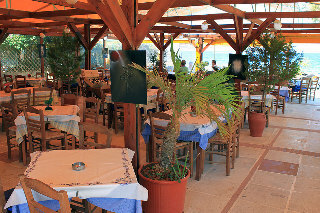 Furthermore, the hotel is only a few minutes from the city center of Chania. The hotel is an excellent place, highly suggested for families as well as couples and individuals. Depending on which room you are staying in, guests will enjoy beautiful views of the beach or the hotel's square. Furthermore, all rooms come equipped with refrigerators and a kitchenette where you can easily cook something up for your friends. Even the hottest of summer days are no problem within our hotel due to the individual A/C systems which can be found in each studio and apartment.